Behavior management systems are a touchy subject. It makes sense that they are. We all have different beliefs on what is the best way to do nearly everything. And, there is validity to just about everyone’s point of view. 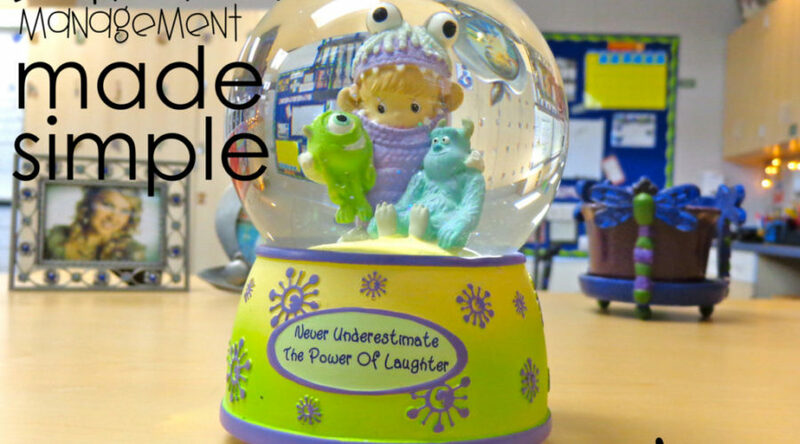 Here are a few of the things I use at one point or another in my class to ensure I have some simple but effective behavior management systems in place at all times. What it comes down to is what works for you. More importantly, what can YOU implement well without driving yourself nuts and damaging the little synapses, neurons and personalities (fabulous, quirky or otherwise) of those little peeps with whom you spend the majority of every single week day. I truly don’t believe there is a right or wrong way (unless the way is to scream at or severely punish a child – cuz that is definitely the wrong way) to run behavior management in a classroom. I DO believe it is absolutely one of the most challenging aspects of teaching. The hardest teaching practice to master. And, maybe most importantly, something that often changes with the dynamics of the class; whether that be from year to year, trimester to trimester, or even month to month. Let’s face it, most behavior systems work differently from student to student. I have found using several different strategies works best for me. Nothing complicated – but enough variance that no one gets to used to the routine. Like I’ve said a million times. . . I’m all about keeping things simple yet effective. The kiddos earn “heart” points. I got the idea from Betz White’s blog. Each time our heart chain reaches the ground we have some kind of big reward. Usually ice cream, pizza or popcorn party. I begin the chain at the ceiling in an area out-of-the-way in the room. It takes a long time for that chain to reach the ground. These hearts are earned when the whole class does a fantastic job on something in class, tackling a difficult concept without whining or giving up, behaving at an assembly, lining up without any issues. Basically anytime I need to make a big deal I love this chain. Simple and pretty. The table circles here are from my Vanilla Sherbet decor line. We earn table and class points. The kids at the table with the most points gets to pick through my fun erasers, or pens or some other little box of goodies, otter pops. The usually choose otter pops! They usually get SEVERAL things. That just ups the desire to get those points. I just give them tally points for anything positive. If the whole table is doing any of these things, they get a tally point. But it has to be the entire table. If the whole class is doing it – the whole class gets points. I get points if I have to repeat directions more than once or wait for students who are talking. My kiddos always conspire together to beat me as a whole group. They don’t want me to win and announce that proudly -a lot. It’s in good fun. They are beyond cute about it. At the end of each month, we start over. The kiddos get their name in the “happy cloud” (or whatever I draw on the board for the month. I change the picture to match whatever we are studying for the month). Those kiddos earn class pennies to spend on our class rewards menu. This rewards menu is SUPER effective! The kiddos much rather have these rewards than junk from a treasure box. The menu is posted on one of our cabinets so the kiddos can refer to it anytime. This encourages them to work hard for those pennies and save up! A large part of my behavior system is my modified “stop light” system. It is similar to a clip chart, without all the stops. In the past I’ve used green, yellow and red strips of construction stuck to my whiteboard with magnets that have the kids names on them. Each year I would make it smaller and smaller because I hated the way it looked and was trying to keep it as “minimal” as possible. Then I got a Cricut! And the red section offers a second chance with “UH OH! LET’S FIX THIS!”. I am in L O V E with this machine! Peeps I can use MY fonts, MY designs, ALL kinds of materials… including fabric and light wood!!!! SERIOUSLY. I can make all sorts of things prettier!! I use a bluetooth to connect to it – less wires are a plus! It can PRINT then CUT your items! Amazing. These pieces of my “stoplight” behavior chart fit together seamlessly because that Cricut makes perfect cuts. I love that none of the construction pieces overlap. The chart remains nice and thin so my magnet system works overtop of it perfectly. I used to use magnets with little black tiles attached. Now I use the same magnets with little white rocks attached using Gorilla Glue Super Glue. I write the kids names on the rocks with Sharpie. No worries about kids who move or using them again next year. Goof Off is amazing at removing Sharpie from things. The marker comes off so easily! EDIT: I’ve found an alternative to these stone-magnets. I grabbed these on Amazon. I write on them with black marker and easily take the names off at the end of the year using Goof- Off. Click the image to follow my affiliate link to find them on amazon. I’ve always wanted to do something with circles, but every time I’d try to cut them, they wouldn’t be perfect and I’d toss my attempts. Cricut has fixed that! I’ve been going circle crazy around here! So that’s it. All of my behavior systems are quick, easy and pretty. Some days require a lot more than just the chart – others require nothing but celebrations of the classroom as a whole. But with all of these systems in place – the different rewards/reminders don’t seem random or misplaced. No one gets bored (especially me) and I feel I have a good “arsenal” from which to pull. No, these are not the only “tricks” – some years none of these are very effective and I have to go a different route entirely. It does depend on the students. No matter what behavior management strategy you choose, though, consistency is key. Easy and simple to use=LOVE it! Plus it's exceptionally cool to look at. Behaviors are one of our biggest challenges as well. Thanks for the idea!